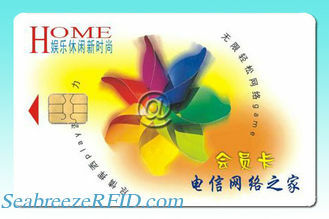 The SLE-4442 chip Secure Memory Card is one of the most popular "Smart Memory Cards" in the world. This chip includes an intelligent 256-Byte EEPROM with Write Protect Function and Programmable Security Code (PSC). This chip contains and EEPROM organized 1024×8 bit offering the possibility of programmable write protection for each byte. Reading of the whole memory is always possible. The memory can be written and erased byte by byte.256 byte encryption card, read data, write data, data protection and password operation.Data can only be changed after entry of the correct 3-byte programmable security code (security memory).Cured user code to protect the factory 32byte write data area. Allow us to Pre-Print your PVC or smart cards with your logo, image or other information. Pre-printing saves you time and money. The SLE4442 is a perfect card for your gift or loyalty program, IT Login, or other applications that you develop using our Smart Card Development Kit. The typical applications for the memory card includes access control, hotel door cards,staff attendance, transport payment, personal identification,etc.